Folding Stand. LoRan Folding Stand  - $9.60 : Yarn Tree, Your wholesale source for cross stitch supplies. Item 8285. 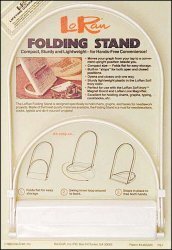 Folding Stand. This compact, lightweight stand from LoRan folds flat for easy storage. Holds graphs, charts, and books in a convenient upright position. Also can be used with your LoRan Line Minder.